life experiences... bus journeys... book reviews... random thoughts... !!! The book had been received as part of Reviewers Programme on The Tales Pensieve. Synopsis of the book is more catchy than the cover and the title. 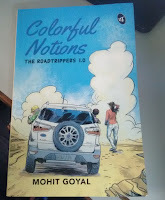 The story mainly revolves around the three youngsters Abhay, Sashank and Unnati who are in their twenties daring to accomplish an Indian road-trip along with a movie on the same.